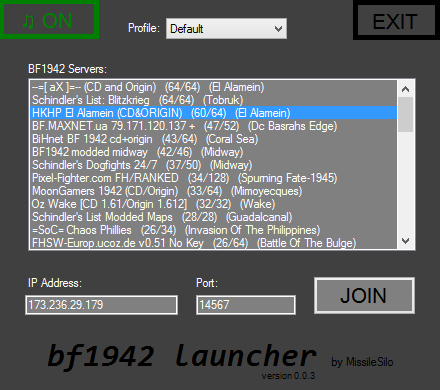 In case anyone is interested, I made a launcher app that shows the most populated BF1942 servers and lets you join a server directly from the app (bypassing GameSpy). The app also lets you switch between player profiles before joining a server. If we need to chip in to promote the server, or if we ally with others to form a promo group, let me know. its not the time for server rivalry we have to do this as one all out fix so 1 download so we as bf1942 community will survive! this doom day. and road to rome and Secret Weapons all in one so we can still get new players to the game easy.